Pearl Yachts USA press release today at 2017 FLIBS! : Atlantic Yacht & Ship, Inc. The 2017 Fort Lauderdale International Boat Show is all ahead full. 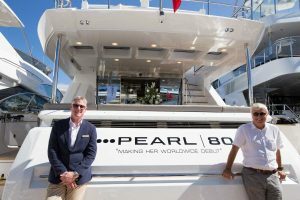 Today we at Pearl Yachts USA introduced the all-new Pearl 80 to the US Marketplace. In the first place, Fort Lauderdale, Florida is known as the “Yachting Capital of the World”. Here will be the 58th annual 2017 Fort Lauderdale International Boat Show on Nov 1-Nov 5, 2017. Furthermore, here you will find information on this Pearl 80 by Pearl Yachts USA. Additionally, this 2017 Fort Lauderdale International Boat Show will have the yacht on display. Features include a full kitchen under stunning sky lights. Furthermore, with a full beam master suite you will feel like home at sea. Moreover, the shower in the master suite is huge and there is even a couch in the VIP suite. This is just the beginning. Later you will find yourself in the hot tub on the fly bridge watching the sun set! So if you are coming by the 2017 Fort Lauderdale International Boat Show be sure to stop by and say hi at our display! Contact your favorite AYS broker for special access! And for more information on the new Pearl 80 at our HeySea Yachts USA display be sure to contact Randy Kires today!